The promotion of commodities to be exported using promotional media such as advertisement in electronic media, magazine, newspaper, trade show, or using institution/agency related to the export promotional activities such as Directorate General PEN, Chamber of Commerce and Industry, Trade Attaché, and so forth. The inquiry from the Importer will be responded using offer sheet sent by the exporter. It contains the details according to the inquiry from importer on description of item, quality, price and date of shipment. Besides, in the offer sheet, it is usually added with the provision of payment and delivery of sample/brochure. After obtaining the offer from the exporter and conduct thorough investigation, and agreed the offer, the importer will send the order sheet (purchase order) to the exporter. According to the data from order sheet, the exporter then prepares the sales contract added with the details on force majeure clause and inspection clause. Sales contract will be signed by exporter and sent in two copies to the importer. Importer will request Opening Bank (Foreign Exchange Bank) to open Letter of Credit as the guarantee and the fund will be used as payment to the exporter according to the agreement in the sales contract. The L/C is for and on behalf of the exporter or other person or entity appointed by the exporter in accordance with the terms of payment in the sales contract. 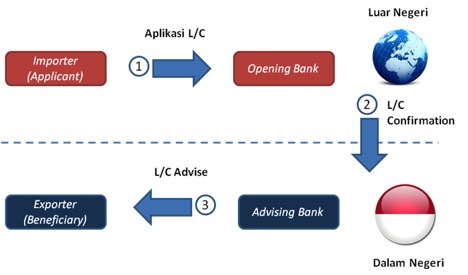 Opening bank will open L/C via correspondent bank in the Exporter’s country, in this case the advising Bank. The process of opening L/C is conducted via electronic media, while the written confirmation will be set in L/C confirmation which is then forwarded by the opening Bank to the advising Bank to be delivered to the Exporter. Exporter will receive L/C advice as reference for shipping the goods and at this point of time the exporter will conduct shipment booking to shipping company according to the terms set in the sales contract. Then, the exporter must process obligation of Notification of Export Goods (PEB) to the Custom at the loading port. And other matters such as payment of export tax (PE) and Additional Export Tax (PET) at the advising Bank. 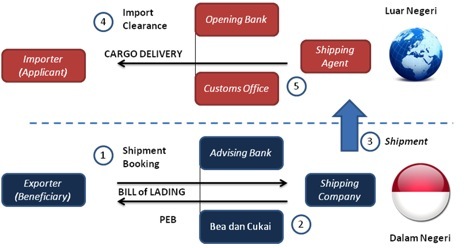 Shipping Company will load the goods and submit receipt of goods, shipping contract, bill of lading as well as other shipping documents, if any, to the exporter, then it will send the documents to the advising bank to be forwarded to the opening Bank. Shipping Company will transport the good to the destination port stated in the Bill of Lading (B/L). Importer will receive the shipping documents if the payment obligation to the opening Bank has been settled. Then, the shipping documents will be used to handle import clearance with the customs at the port and to pick up the goods from shipping Company that loads the order. Shipping Agent will deliver the goods to the importer if any service fee for the shipping agent has been settled. After receiving B/L from shipping Company, Exporter will prepare all necessary documents required in the L/C such as invoice, packing list, quality certification, Certificate of Origin (SKA), and so forth. All documents will be delivered to negotiating Bank, which in this case is the advising Bank, set in the L/C to receive payment over the L/C. Negotiating Bank will check the completeness and accuracy of the shipping documents delivered by the exporter, and if all match to the requirements in L/C, then negotiating Bank will process the payment according to the bill from the exporter from the existing L/C fund. Negotiating Bank will send the shipping document to the opening bank to receive reimbursement over the payment to the Exporter. 4. Opening Bank will check the completeness and accuracy of the shipping documents, and if all match with the requirements in L/C, the opening Bank will settle the payment (reimbursement) to the negotiating Bank.